Sindh’s wait is over or not? Another rain spell in northern areas! Western winds – A good neighbour? 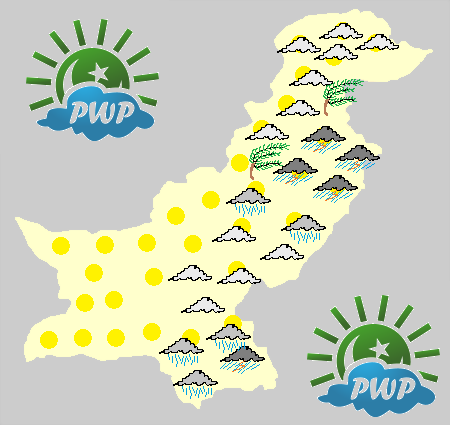 Pakistan Weather Portal (PWP) had successfully predicted the onset of monsoon (1st spell) over the northern areas during the late first week of July. PWP on June 25 forecasted these rains and on July 3 gave their arrival time on July 6/July 7. Monsoon brought scattered moderate downpours to many parts of northern areas as it advanced into Islamabad and Lahore. Monsoon would now shift its focus to central and southern parts in coming few days. Sharp pre-monsoon drizzle occurred in Karachi during the early hours of July 8, this activity started from July 5. The first monsoon spell started from July 7 and would last till July 10, although its intensity has decreased significantly since the last 24 hours due to weakening of monsoon in the north-western parts of India and disturbance in the activity in the western winds. The second spell would start from July 11 and last till four days with variations in different parts of the country. Whats going to happen now? Rainfall started from the early hours of July 7 and they gained peak intensity during the morning of July 8. On July 8, the northern and the central parts of the country experienced scattered moderate showers while some areas got isolated heavy rainfall. Western disturbance ’12’ entered the northern areas of Pakistan on July 6, it brought moisture in the northern as well as the central areas. WD 12 helped the monsoon to advance into the upper parts of the country. Saidu Sharif got 51 mm. Will rainfall occur in Karachi? Much awaited Low pressure is here! The aging monsoon finally advanced into the capital of India on July 6, New Delhi after a week delay. The monsoon winds have gripped almost every part of north-western India however some extreme western parts are yet to experience rains. Monsoon is yet to grip entire India, it is likely that it would do so around July 15 as fresh another cyclonic circulations would boost rains over the central parts while widespread heavy downpours are also expected along the eastern coast of India before July 15. However rainfall have been 30% below normal in the entire country till now. Pakistan Conditions: Outlook for possible return of rains. *Monsoon winds would shift towards lower parts of the country; rains could re-organize in upper areas. Well-developed thunderstorms could affect the northern areas during the late this week and middle of July. Although the current spell of rains is weakening, a second monsoon spell would start from July 10 night/July 11 night. Rainfall with moderate with chances of isolated heavy falls. Rain will be accompanied by thunder and fast winds. 35°C to 39 °C in Islamabad. In Northern Punjab: Lahore, Faisalabad, Murree, Rawalpindi, Sargodha, Sialkot and other adjoining cities. The second spell of monsoon would start from July 11/July 12. The effect of 1st spell is weakening in the northern areas and would further weaken by July 10 morning. Rainfall with moderate falls is expected. Rain will be accompanied by thunder and fast winds. 34 °C to 37 °C in Lahore. 42°C to 46 °C in Faisalabad. In Southern Punjab: Bahawalpur, Multan, Rahim Yar Khan, D. G. Khan and other adjoining cities. Pre-monsoon showers are expected till 48 hours while there are chances that the actual monsoon could advance into this part from July 13 till July 16. Rainfall with moderate showers. Rain will be accompanied by thunder. 36 °C to 45 °C in Multan. 37 °C to 44 °C in Bahawalpur. In Upper Sindh: Sukkur, Larkana, Jacobabad, Kashmore, Nawabshah and other adjoining cities. The 1st monsoon spell could begin from July 11/July12. The rains would be short-lived, they will be accompanied by winds and thunder, it will be light in intensity with slim chances of moderate falls. Temperatures remained stationary in many parts of upper Sindh while few highs were recorded in few cities. 40 °C to 43 °C in Sukkur. 41 °C to 43 °C also in Larkana. 35 °C to 42 °C in Nawabshah. In South-eastern Sindh: Mirpur khas, Umerkot, Tharparkar, Badin and Hyderabad. The 1st monsoon spell could begin from July 10 late/July 11. Rain will be accompanied by fast winds and thunder, it will be mostly moderate in intensity with slim chances (5%) of isolated heavy falls in some extreme eastern parts, bordering Gujarat especially Tharparkar district. Temperatures will also remain calm in south-eastern Sindh. 34 °C to 39 °C in Hyderabad. In coastal Sindh: Karachi, Thatta, Keti, Shah Bandar and other coastal localities. The 1st monsoon spell could begin from July 11/July 12 and continue till 48 hours, it will be mostly light in intensity with moderate falls. ← Screams of hell were heard by all! @ K.M, SO you mean that Forget heavy rains in Karachi this year also. Every map is showing daily heavy to very heavy downpours over Punjab,Nwfp and Kashmir specially UK Maps. There are chances of isolated heavy falls in up pak.. This low pressure area will dissipate before reaching near Pakistan. No chances for rain sindh ..Only light drizzle possible. 15 mm rain that occurred in Multan was Monsoon rain or Pre-monsoon rain? haaaaen!!!! phir Monsoon or Pre-Monsoon mai kya farq hota hai, Sir? Thank u Very much for detailed forecast of sindh,,but from your forecast i mean that no good news of heavy rain in central sindh,, fresh UAC which formed over orissa will it intensify into low pressure or not? Its hard at the moment as once the current low dies out, monsoon might go on break..
Sir what will be benefit of intensification of system? Does increase in intensity of system will causes heavy rain in sindh? For scattered heavy raifall, It will all depend upon the strength of the system once it nears Sindh..
Hi, Babar so at last it is here so are we mean karachites getting something????? The monsoon thunderstorm is over entire Sindh, there are chances of isolated shower/rain in the coastal cities including Karachi too. @ K.M, When coastal sindh like Karachi will get thunderstorms? Karachi should get some rain now… there are chances on July 11 as well. Mirpurkhas city m aj 1st Monsoon Rain hui bht maza aaya…Babar bhai Mirpurkhas m our barish ka imkan hai?? ?our sindh m Mosoon ka 2nd speel kb hoga? Aray bhai sirf Karachi mein rains bohut kum hongi aur hosakta hai kay kuch bhe na ho this year. Interior sindh mein ziada rains horahi hai 2nd straight year hai aur pak met nay yeh bhe kaha tha kay punjab,nwfp aur kashmir mein ziada barishi hongi. BABAR BHAI AUR PAK MET BOTH ARE 100% CORRECT. Ab is mein koi new thing nahi kay Karachi mein rains nahi horahi hai. Sir amazingly no rain falls in our nawabshah area even sky was clattering with thunders,is any chances of rain in nawabshah today or tommorw and when will another spell hit sindh?? K.m have not not reported any news regarding system in sindh we are confused that what is going to happen in central sindh,,,sir the system in sindh has weakned or not? Sir how much we have to wait for second spell in sindh?? 1st spell disappointed very much because of no rain in central sindh…. It still going to be the 1st spell in the central Sindh, since that first one remained confined to SE Sindh..
@ K.M, Monsoon missed Karachi, When expected rain? Can you expect a thundershower todays evening in sindh from current worthless system? Chances very slim, its mostly clear..
@KM : what happened to that 2nd UAC that formed ? I dont miss rain anymore bc0z it’s not worth missing anything thats never g0nna c0me. hyderabad division, observed a moderate rainfall in night of 10 july, now when 2nd spell of monsoon rain is expacted in lower sindh especially in tando allah yar near hyderabad, n what r the chances of monsoon rains in lower sindh this year is it normal, below normal, or above normal like last year? Check the articles on the ‘monsoon of Pak’ page..that would help..
Sir PMD said in its 10 days forecast that southern sindh will get thunder showers on 18 to 20 july meaning that no rain in central sindh from coming spell as well?? PMD has forecasted thunder showers in nawabshah,sukkur,larkana in next 24 to 48 hours do you agree with forecast? There has been no cloud formation over Sindh province yet..its all happening in the neighbourhood..
PWP please tell me when Karachi gets a good heavy monsoon rains? PMD is forecasting Heavy rain in upper punjab including lahore and urban flooding may occur.. Whats your forecast for tomorrow? Lahore/Islamabad have daily heavy rains forecast, Any day or every day could be urban/Flash flooding. AOA, kindly provide a link of all type of satellite pictures of Pakistan on PWP page……… and also include sun & moon rise/set timings on your page.. it will be beneficial for all of us..
For satellite images look towards the left corner of the blog, would try to improve more..
Sir Will there be any effect in upper sindh from 2nd spell that is in punjab? Where is detailed update for KhyberPK??? Will central sindh get any shower in july or we have to until august and september like last year?? Sir if el nino appears after august then what will be scenario of monsoon especially in sindh? chance of Sharp drizzle/isolated shower..
Sir if el nino appears that mean we will get no rain?? And if it appears then will it effect 2013 monsoon? It would affect the latter half of the season.. It would be published tomorrow. Sir when next spell expected to hit sindh? Not soon, maybe last week of July..
Sir why the monsoon is inactive,el nino have also not appeared at that time? I don’t think we would get any rains from the current forming UAC either. @ K.M, Cannot understand that on one hand daily heavy downpours over Punjab and Khyber and almost daily some areas of these two provinces getting good rains and on other hand Karachi could not get single meaningful rainy day and very less changes that this year Karachi will get any rain. Except light drizzle for few seconds on one single day in Karachi otherwise sunshine daily only. Not daily heavy downpours, rain has been moderate in Punjab..
there has not any activity of monsoon is appearing on karachi… what we called the reason sir?? due to dust atmosphere??? is there any chances of rain in august sir??? Monsoon activity has started, early morning cloudy weather is its best example. The city is now just missing the rains to fill the gap. So far the monsoon flow over north-west and western India has been weak due to the absence of a strong weather system that is why monsoon rains have failed to advance into south Pakistan. There are chances of drizzle in the city during this week while slim chance of shower during the second week. yeah am agreed with that.. you mean that there has not any chance of heavy rain during monsoon system in khi??? if we point out past we always got heavy rains in the month of august,now august is also dark sir??? Since the weather is behaving a little erratic, therefore the spells are not confirmed but two to three spell ‘could’ occur in August. I would publish Pakistan Weather Update article on August 4 or 5. The last August in which it didnt rain heavy was 2008, there are slim chances during the second week but the rains looks light/moderate. There are chances of drizzle/isolated shower on August 6/7. It would stop once the cloud activity near eastern Sindh would end or a weather system is nearby. one thing i want to ask you that how western disturbances help in formation of thunderclouds when interact with monsoon moisture. 1)are they carry moisture from Caspian sea? or 2) these winds are cool and due to coldness they increase the humidity of the moist monsoon winds? summer western disturbance have weak cold air that gains strength by absorbing the land moisture that is ample during the monsoon season and thus leading to a thunderstorm. There are two types of WDs; winter and summer both slightly different. I think 6,7,8 date ko hyderabad me barish ho gi accuweather pe likha tha kya wo sahi likha huwa he ya barish nahe hogi? 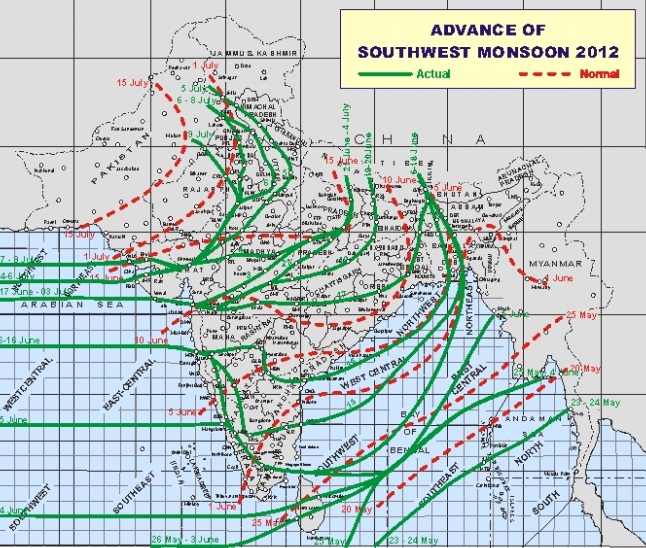 There are chances but doesnt look heavy..I have updated the monsoon page. Sir i have a question Can we expect for heavy rain durin this monsoon season??? Doesnt look so till the mid of this month..
Sir imd had said that el nino has still not affected monsoon than why monsoon is still not reaching properly in sindh? Other parts of pakistan are getting rains except sindh what is cause of it? And when a heavy spell will hit central sindh? El-nino has not formed yet but it is in the PROCESS of forming. IMD did tell the press that the ENSO conditions has affected the monsoon. Northern parts of Pakistan has also gotten less rains..
@ K.M, Almost every other zordar barish horahi hai punjab,khyber aur kashmir kay bohut say ilako mein aur kuch mein moderate bhe Aur yahan Karachi mein to ek qatra tak nahi giraha hai asmaan say. Yahan to monsoon every other year failed hojata hai ya to aakhir mein bheek daykar chala jata hai karachi ko. Karachi islamabad say itna bara hai but rains yahan Islamabad jaisay mein nay aaj tak nahi dekhi. 2007 ho ya 2010 but Islamabad jaisay frequent heavy rains Karachi mein kabhe nahi dekhi. Asal Monsoon to upper Pakistan mein aata hai. They have also gotten less rains..
yupee… 🙂 severe thunderstorm here in Sialkot and Gujranwala. Shukar ha ALLAH Pak AAp ka lakh lakh. it was very hot n humid here. @K.M. bhai for how long this weather system will persist and are there any rains expected in next week also? very weak, few parts to be affected.. Mentioned the six spell in the monsoon of pakistan page (August 3).. 7th spell also likely..
Would nawabshah get any rain in few days like islambad? ye jo spell aega us ki intensity kya hogi?